Kochi Blue Spikers become the second team to make it to the playoffs with a comeback 3-2 (12-15, 10-15, 15-11, 15-13, 15-10) win over Chennai Spartans in a thrilling encounter. Prabagaran S was the star of the show tonight at Pro Volleyball League for Kochi with 12 points (11 spikes and 1 block). Rudy Verhoeff in spite of scoring the maximum points by a player in a match for the season i.e. 20 points (17 spikes and 3 blocks) ended on the losing side. Chennai started the match strongly as they raced to a 4-2 lead. Kochi pulled back the points and it was looking like a battle of the equals but Chennai entered the first Technical Time Out (TTO) with just a two-point lead at 8-6. Post TTO, Chennai piled up the pressure as they went into a 13-8 lead with GS Akhin converting on Kochi Blue Spikers’ Super Point. Kochi pulled back, thanks to five errors in the set by Chennai, as they reduced the lead to 11-13. But Chennai didn’t leave it for late and closed the set at 15-12 with a spike from Ruslans Sorokins. They continued to be the dominant team with strong defense and attack. Kochi was hardly able to garner points on their own as they scraped some via Chennai’s errors. Chennai led 8-5 at the TTO and were in a different zone converting their Super Point at 10-7 to go to 12-7. Immediately, Kochi Blue Spikers called for a Super Point and converted but Chennai wrapped up the set 15-10 to lead 2-0 in the match. The third started with both teams keeping pace with each other till 4-4. 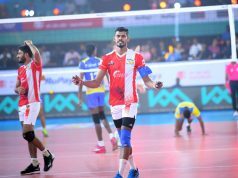 Unforced errors by Sorokins and Naveen Raja Jacob allowed Kochi Blue Spikers to have the lead for the first time in the match as they entered the TTO with a four-point advantage. 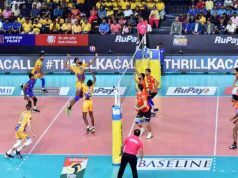 Chennai called for a Super Point on Kochi’s serve and converted it with a spike from Rudy Verhoeff to reduce the gap to two points. But unforced errors cost Chennai six points and then Kochi won their Super Point too to pull one back at 15-11. In the penultimate set, Kochi took a 3-0 lead, owing to the errors by Chennai players and a spike by K Praveen Kumar. Chennai recovered and levelled the score at 5-5. It was 7-7 when a service error by Verhoeff gave Kochi a point advantage going into the TTO. The set was now picking up the heat as breathtaking rallies got the spectators on their feet. Chennai called for a Super Point at 7-9 and converted similarly Kochi converted their Super Point on Chennai’s serve. 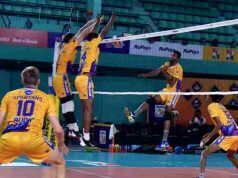 Kochi was scripting a dramatic comeback as they took the set 15-13 even after the best efforts from Chennai to establish parity in the match. 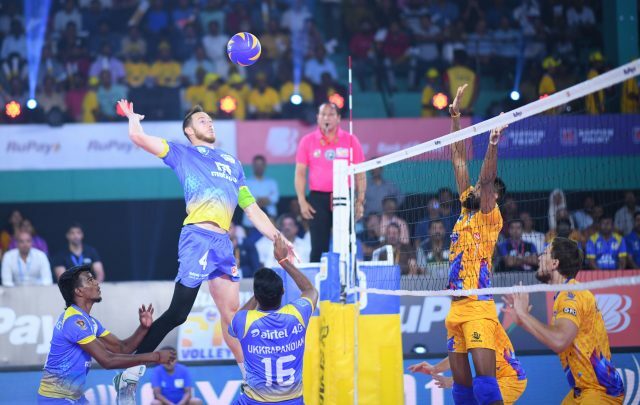 It was nail-biting action as both teams played to win but unforced errors by Verhoeff and Jacob cost Chennai as Kochi Blue Spikers held a 2-point lead at TTO. Chennai called for a Super Point at 6-9 and a wayward spike by Verhoeff gave a five-point advantage to Kochi. With the momentum and crowd on their side Kochi won the set 15-10 and match 3-2. 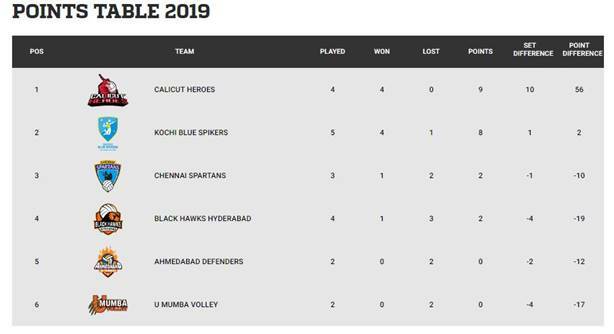 U Mumba Volley will take on Black Hawks Hyderabad on February 12th 2019. It will be broadcast Live and Exclusive on SONY SIX and SONY TEN 3 and will be streamed live on SONY LIV from 6:50 PM IST.